La Pavona Sea View Apartment is a newly restored property in Monterosso, just steps from the village activities (beaches, train station, stores and restaurants). It lies in quiet and dominant position. From property guests will benefit of a relaxing amazing views on the Mediterranean vegetation and waters. La Pavona apartment occupies ground and first floor of a 4-storey building where only another apartment is located. La Pavona Sea View Apartment: calling it apartment is quite reductive, it’s more a villa, even though located in a building with other residents, another apartment on the two upper floors. Privacy of this elegant and exclusive property is guaranteed and we barely notice other guests live in the building. Main entrance to the property is from a private gate and garden. On ground floor we have a welcoming dining area with large wood dining table, Then a fully equipped kitchen, a large sitting room that opens on the al fresco area with table. Then, next to the dining area, we have a spacious double bedroom with en-suite bathroom and shower. A curious blue staircase takes us to the first floor where we have another spacious and bright open space. Here we find couches, large panoramic windows and a balcony. The views from La Pavona Sea View Apartment upper floor on the luxuriant Mediterranean vegetation and the Cinque Terre coastline is just amazing. From the sitting room a corridor takes us to a twin bedroom, a double bedroom and 2 bathrooms, one with shower and one with bathtub and washing machine. Both double and twin bedroom open on another patio and garden, ideal retreat for lovely and relaxing hours. The upper floor this elegant private property is equipped with air conditioning (not needed on ground floor) and wifi. Two private car parking spots below the property. 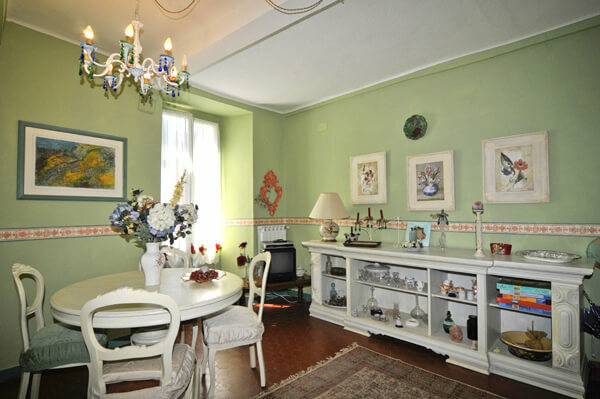 La Pavona Sea View Apartment is a marvellous and unique opportunity for a lovely and memorable holiday in Monterosso. 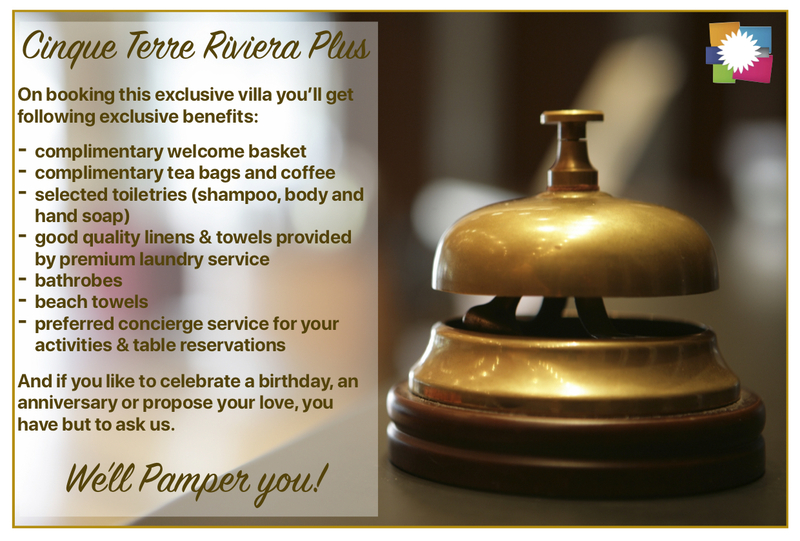 Ideal for couples and families it offers all comforts one guest may need. Location, refined furbishing, air conditioning and wifi make it an upscale property. From La Pavona Sea View Apartment beaches, train station, stores and restaurants are all at walking distance. Just consider that the road, on coming back is rising uphill, but the property is served by taxis from any other part of the village. It’s anyway a lovely walk.